Researchers are set to present a new remote management gait guidance system for people with Parkinson’s (PwPs). REMPARK, a three-year EU-funded development, is an integrated ‘wearable’ health system based on intelligent sensors worn around the wrist and waist to detect the wearer’s motor status in real time. The symptoms of Parkinson’s, which can include freezing of gait (a sudden inability to move) and dyskinesia (involuntary and uncontrolled movement), can lead to an increased risk of falls. 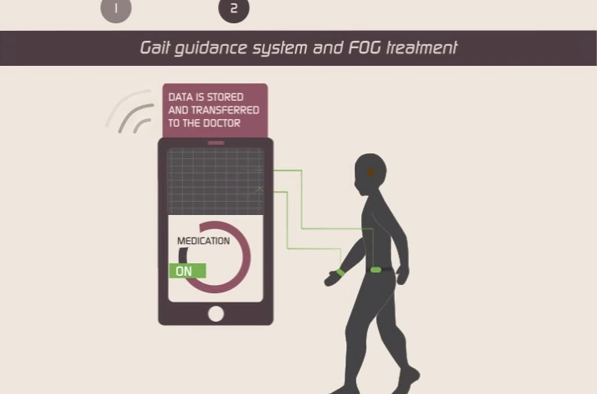 The system triggers a gait guidance system and relays information directly to the patient’s physician as soon as an episode of freezing, dyskinesia or fall is detected. The researchers developed the system using self-adaptive visual and auditory cueing as well as exploring a haptic cueing system, based on electronic actuation – stimulating the muscles of the legs to move. REMPARK’s final workshop – which is open to the public – takes place in Madrid on 21 April. The project’s leaders will present technical and medical highlights of the study, along with practical demonstrations of a new wearable health device they have been developing. Guest speakers including Dr Gurutz Linazasoro and Sara Riggare will give their expert views on the role of technology in treating Parkinson’s, and their predictions for future breakthroughs in disease management. Attendance is free to anyone with an interest in Parkinson’s, but places are limited. Register here. Full event details and more about the project can be found here.